Best high-resolution digital audio player: Which DAP reigns supreme? If you listen to your music randomly—using the shuffle songs function in iTunes or on an iPod, or with the iTunes DJ (formerly Party Shuffle) feature in iTunes, for example—you’ve probably noticed that some songs are louder than others. For instance, much pop music is recorded very loud, and a lot of jazz and classical music is much softer. In addition, record producers seem to be increasing the volume in recent years: you’ll find that older music may be softer than newer recordings. As such, you may find yourself adjusting the volume of your playback device, and doing so often. 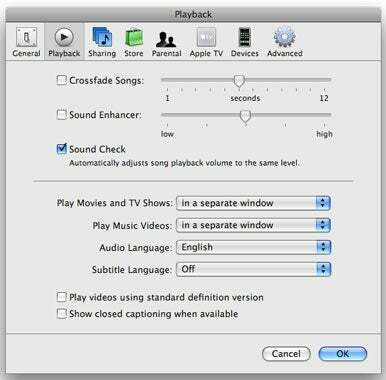 To turn on Sound Check in iTunes, check its option in the Playback preferences. When you check the Sound Check option in iTunes, and click on OK, you’ll see at the top of iTunes’ window that the program is “Determining Song Volume” for your music. Depending on how much music you have, this can take some time; iTunes checks not only your music, but also your podcasts and audiobooks (though not your movies or videos). What iTunes does is calculate an average volume level for each track, compared to a preset norm, and adds information to the track regarding how many decibels it should be increased or decreased. You can see the result of this in the Summary tab of the Info window for any track: there is a Volume entry with a number of dB (decibels), and either a plus (+) or minus (-) sign. Here you can see that iTunes will increase the volume of this track by more than 15 dB—quite a bit. In some cases, you may want to permanently alter the volume of one or more tracks, so you can play them with other software or on other devices—perhaps as ringtones. You can do so with a program such as Rogue Amoeba’s $32 Fission 1.6.2. This program lets you edit audio files non-destructively—that is, without decompressing and recompressing them, which many other applications do. With it you can alter the volume of a track, increase or decrease the gain (volume) of tracks (or even sections of tracks), and normalize the volume of tracks (which means making it as loud as possible without causing distortion). If you make changes to your music, make sure to keep backups in case things don’t turn out exactly how you want them to. However, if you listen to classical music, I would strongly recommend turning off Sound Check. 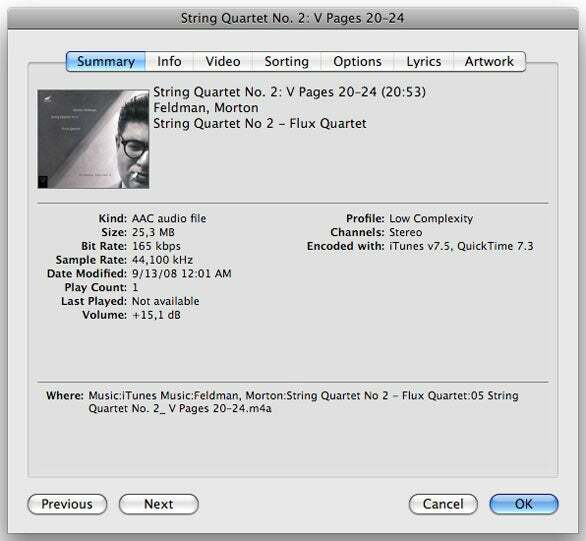 In the example above, iTunes wants to play a quiet section of a very long string quartet at +15 dB, but other sections at -1 dB. This would ruin the dynamics that the performers strive to establish. Dynamics are very important in classical music, and just because one movement of a work is louder than another doesn’t mean that its volume should be lowered. The same may be the case with live music: it’s more likely, if you’re listening to an entire concert, that the volume changes will be disturbing. Sound Check is most useful with songs played at random, not with albums or other groupings of music that are designed to be listened in order. Senior contributor Kirk McElhearn writes about more than just Macs on his blog Kirkville.